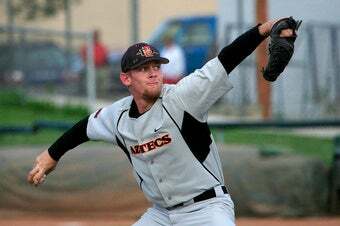 Stephen Strasburg, this year's can't-miss baseball prospect, has started 13 games at San Diego State and he's won 12 of them. You don't need to be Billy Beane to notice that Strasburg, therefore, has won more games than the Washington Nationals, who are 11-27 and badly in need of a guy who can go 12-0 with a 1.34 ERA and 174 strikeouts. The Nationals' entire pitching staff has struck out only 228 batters. So the Nationals will draft Strasburg with the No. 1 pick in the MLB Draft, and they will bicker with the Scott Boras client until August, when both sides realize that the Signing Deadline is the next day and the extra $100 grand isn't really that necessary. But don't expect to see Strasburg padding the Nationals' paltry pitching stats this year. Washington G.M. Mike Rizzo told Jeff Passan that he can't imagine Strasburg joining the team without doing time in the minors. If the Nationals wanted to make some easy cash, though, they would start him Sept. 28 at home against the Mets, take a page from San Francisco, and jack up the ticket prices. Which brings us to an existential dilemma: Would you pay $250 to watch a 55-100 team?